A week and a half ago, I was lucky enough to attend a cello concert in a unique setting. I went as the guest of a fellow student in my department who is also an Oxford alumnus; the concert was an Oxford alumni network outing (though not exclusively–most of the people in the audience weren’t Oxford folk). It was held at the Mojica Hacienda, a house on an estate in a lush and secluded neighborhood of Santa Monica, near the mountains and the ocean. The house belonged to tenor-turned-priest José Mojica and was apparently a hangout for the Gershwin brothers, Hollywood stars, and Albert Einstein, among others. The grounds are maze-like, with really lovely gardens: fuchsias and hollyhocks, water lilies in the pond, a wall draped in Thunbergia alata (yes, I had to look that up). We took a look in the small chapel, which had many small plaques expressing gratitude to the Virgen de Guadalupe or some saint for a miracle or for recovery from an illness or an injury. They had texts in Spanish and painted depictions of whatever had befallen the individual in question (one showed a person being thrown from a horse). The house was filled with tapestries and silver and had a miniature movie theater in addition to the specially built concert room where (we were again reminded) the Gershwins had played. It was an intimate space, reminding me a bit of a Syriac church in Paris where I attended another cello concert years ago. The concert itself was great. The cellist was Evgeny Tonkha, and he played a variety of short pieces, half of which I’d played myself in some form or another and so was familiar with. The program included the prelude, sarabande, and gigue from Bach’s third suite for unaccompanied cello, the first movement of Schubert’s arpeggione sonata, an arrangement of Sibelius’s Valse Triste, Bartók’s Romanian Dances, a modern composition entitled Intro Version (the composer, Anna Drubich, was at the concert), and finally arrangements of a Gershwin prelude and Rhapsody in Blue. Tonkha’s spiccato was impressive. The one disappointment was that the program was supposed to include this chaconne by Giuseppe Colombi, supposedly the first piece ever written for cello. I’d never heard of the piece or the composer and was looking forward to hearing it, but for whatever reason Tonkha didn’t play it. Afterward, there were refreshments in the garden, and my colleague and I met a few other Oxford alumni who were all now also at UCLA. One of them told us a story about his friends who punted to London in their white ties after the Magdalen Ball. It took them three days. Also, it turned out the reason the concert was an Oxford alumni outing at all was because the person in charge of the Mojica Hacienda’s classical music programming had been a Rhodes scholar at Oxford (he also bore an uncanny resemblance to Gérard Depardieu). Anyway, as you read this I may have just arrived in Oxford myself! I’ll be in England through the end of June. So, I hate shopping. My whole family is allergic. Consequently, it is an unusual day that sees me entering a store to buy anything other than groceries or perhaps books. However, I also covet musical instruments. And so a week or so ago, when a couple of violin cases appeared in the window of one of the National Council of Jewish Women thrift shops in my neighborhood, I noticed. I’ve kind of wanted a violin for a long time. In orchestra class, I’d always ask my violinist and violist friends to let me play their instruments. Toward the end of high school, a friend of mine lent me her violin for a summer so I could really figure out how to play. And then at the end of my senior year of college, a friend from Folk Dance Club lent me her violin for that strange in between period after classes had ended but before graduation, and another folk dance friend and I wandered the dormitory playing “The Wren” on penny whistle and fiddle, respectively. In fact, it was because of Folk Dance Club that my interest in acquiring a violin intensified. I discovered oodles of jigs and reels I wanted to play, and though I could play some of them on the cello, there’s less scope for fiddling on the cello than there is on the violin (Natalie Haas notwithstanding). 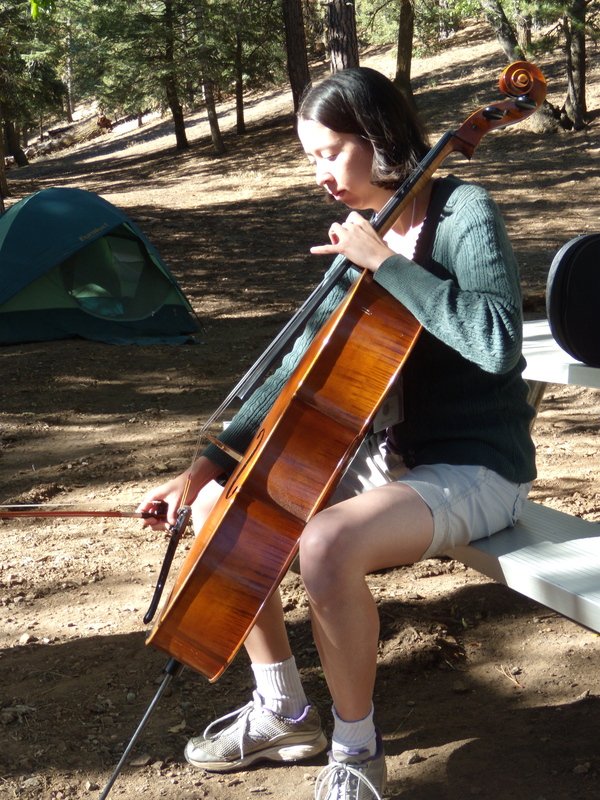 But I knew I wasn’t going to pursue the violin seriously enough to make it worth going out and buying an actual good instrument, so I just waited and learned to play lots of tunes on cello. I squeezed into the space between the jewelry case and a belt rack and picked up the violin cases. They felt too light to have anything inside, but when I unzipped them, there they were, the violins. One was missing the G string, and the other was missing both the D and A strings, but neither was broken. I tightened and loosened the bows, twisted the fine tuners, examined the pegs, plucked the strings, and peered through the F-holes. I’m decidedly lacking in expertise, but the instruments didn’t strike me as pieces of junk. 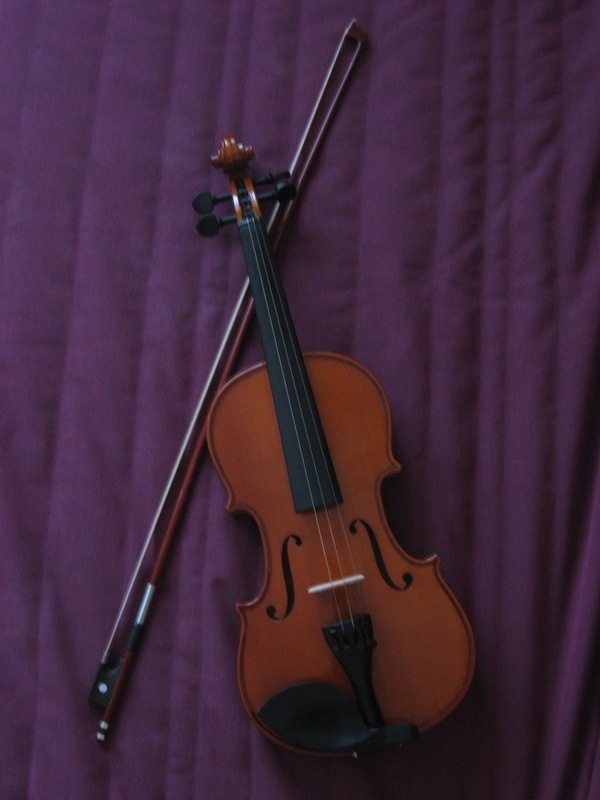 So I decided to buy the three-stringed violin. As I was discussing the price with a clerk, a small group gathered, apparently impressed that I was buying a violin in a thrift shop. A woman even started to ask me for advice as she considered buying the two-stringed violin for her fifteen-year-old daughter. 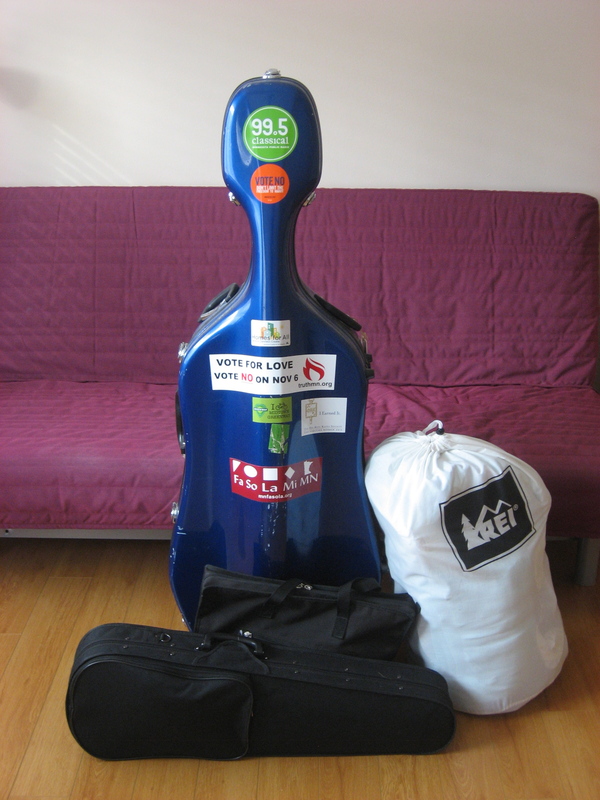 If I am an amateur cellist, I am a dilettante violinist. I don’t aspire to play Bach partitas. In Sparkers, though, Marah plays the violin, not the cello. Why? I’m not really sure. I think I pictured her tromping all over the city with her instrument, and I couldn’t really see her lugging a cello around. But in Book 2, which I’m currently revising, the main character is exactly like me. 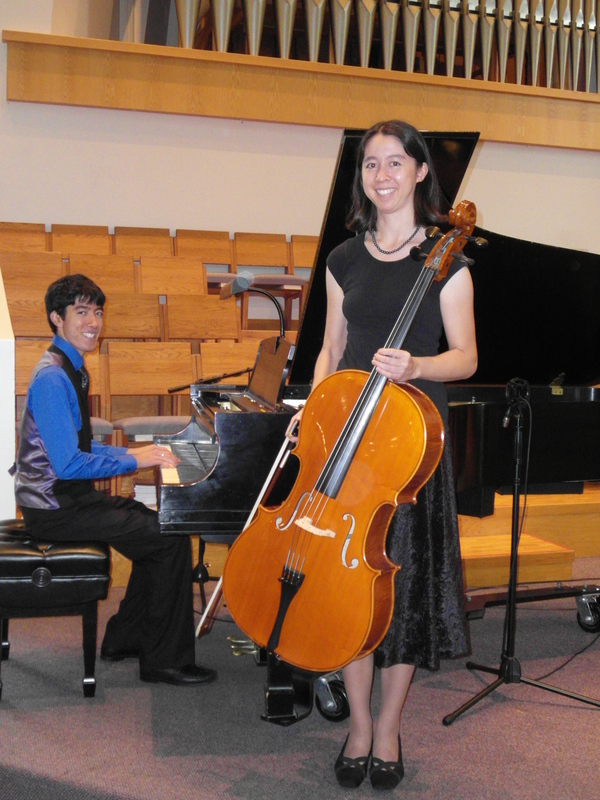 She’s a cellist by training, but she likes to mess around on her brother’s violin too. So putting myself in her shoes can be my excuse for spending time playing my new violin. 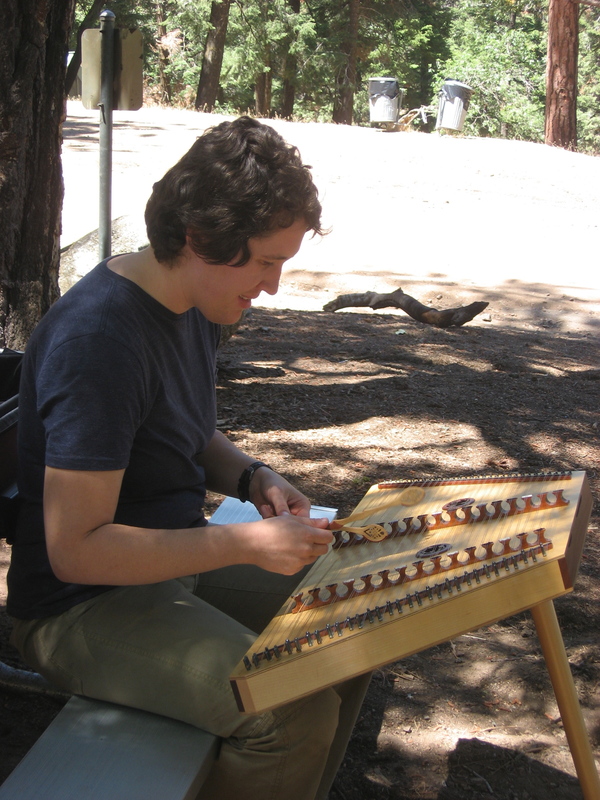 Now, how many years will it take me to acquire a nyckelharpa? Sparkers‘ publication date is less than one week away! If you live in the Twin Cities or nearby, you are most welcome to join me for my launch party at Red Balloon Bookshop on Grand Avenue in St. Paul this Friday (in two days!) at 6:30pm. I left Los Angeles last Thursday at the tail end of a short but brutal heat wave, and I was eagerly anticipating experiencing some proper fall weather. I was in luck. Within half an hour of disembarking from my plane, I was speeding toward all the best that autumn in Minnesota has to offer. My brother and I were due to play an arrangement of Pachelbel’s Canon for our cousin’s wedding in two days and had yet to rehearse together, so I was heading to his school for a quick practice session. The charming town of Northfield, MN is home to two small liberal arts colleges (and a Malt-O-Meal factory). My childhood best friend attended Carleton College, and my brother studies at St. Olaf College (or Count Olaf College, as I like to call it). Because of all these connections, my family and our family friends had often visited these colleges in the fall and bought apple cider doughnuts at a farm along the road to Northfield. I, of course, was never around in the fall, and so despite having heard about these doughnuts many times, I had never tasted one. On this trip, I was determined to have one. So before reaching St. Olaf, we stopped at Fireside Orchards. It was a glorious fall afternoon, sunny and warm, but not hot. 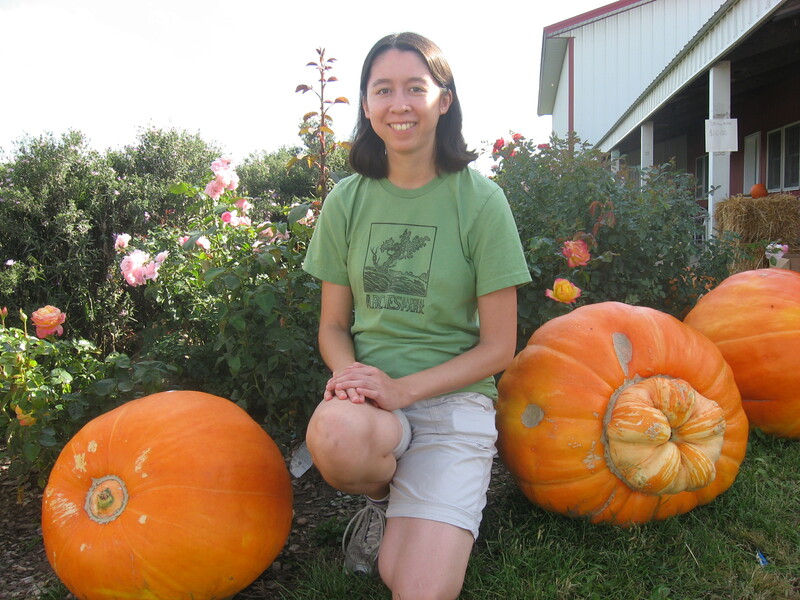 At the edge of the parking lot, enormous pumpkins rested on the grass, and a stone’s throw away, rows of apple trees marched down the slope. Inside the shop were the famous apple cider doughnuts, as well as apple pie, apple cider, and bags of apples (SweeTangos, the first Honeycrisps, etc.). Not to mention jams, honey, maple syrup, homemade fudge, and cheese curds. The rest of the weekend was dominated by wedding preparations and festivities. Friends and relatives came from every corner of the country (California, Florida, New York City). Everyone in the family was hosting someone. My brother and I squeezed in more last minute rehearsals. The afternoon of the wedding was sunny and breezy. For the ceremony, my grandmother wore a cheongsam handmade for her in Hong Kong in the 1960s. My brother and I pulled off the processional without a hitch. A storm rolled in, and we all drove through the rain to the reception, which was held in a chalet at the foot of a (still green) ski slope. Before dinner, the sun broke through the clouds, and a double rainbow glowed in the sky. 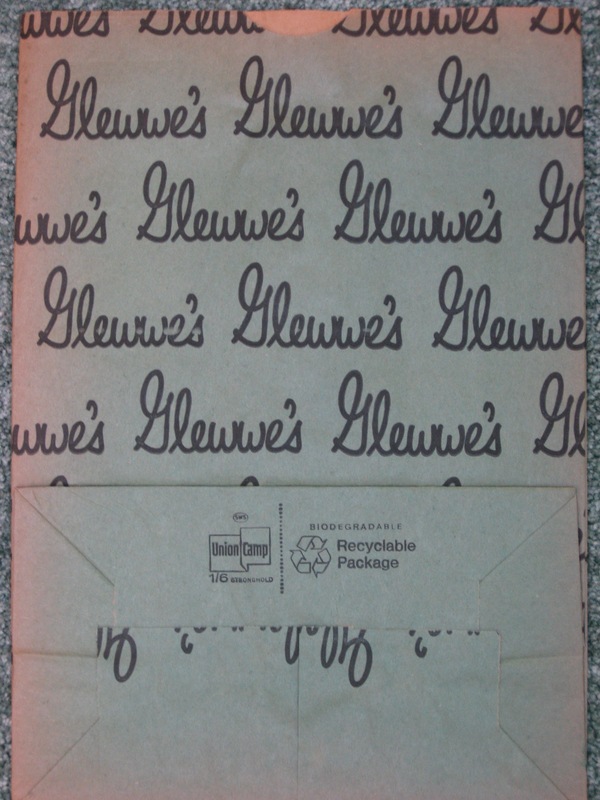 Last but not least, I may have missed the Glewwe reunion earlier this month, but my family saved me this genuine paper grocery bag from one of the Glewwe grocery stores in South St. Paul. Somebody found a box of them in their house. The first Glewwe grocery store was opened in 1905 by Henry Glewwe, the brother of my great-great-grandfather (or my grandfather’s great-uncle). He ultimately opened three stores, and the last Glewwe’s closed in 1986.